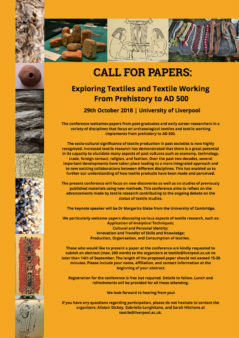 Conference on archaeological textiles and textile working implements throughout the world, from prehistory to AD 500. 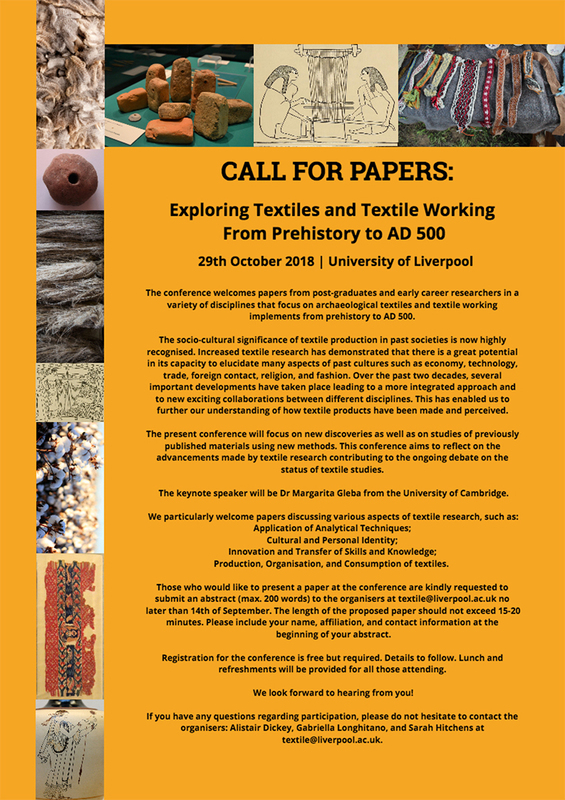 The conference on “Exploring Textiles and Textile Working from Prehistory to AD 500” welcomes papers from post-graduates and early career researchers in a variety of disciplines that focus on archaeological textiles and textile working implements throughout the world, from prehistory to AD 500. The socio-cultural significance of textile production in past societies is now highly recognised. Increased textile research has demonstrated that there is a great potential in its capacity to elucidate many aspects of past cultures such as economy, technology, trade, foreign contact, religion, and fashion. have been made and perceived. on the status of textile studies. The keynote speaker will be Dr Margarita Gleba from the University of Cambridge. -Production, Organisation, and Consumption of Textiles. Those who would like to present a paper at the workshop are kindly requested to submit an abstract (max. 200 words) to the organisers at [email protected] no later than 14th of September. The length of the proposed paper should not exceed 15-20 minutes. Please include your name, affiliation, and contact information at the beginning of your abstract. Registration for the conference is free but required. Details to follow. Lunch and refreshments will be provided for all those attending.